Die Schlachtschule teaches the art of foot combat appropriate for a medieval European knight. Why resurrect these lost arts in the 21st century? Each student must answer that question for himself, but many of us have a real fascination for the Middle Ages and the knights who lived in that violent and bloody time. Martial arts in general give a focus and discipline to our lives, and medieval martial arts give us a connection to that culture, so combining those two things can be extremely satisfying. Medieval combat skills have little relevance to the modern world; you will never engage in a real sword or pollaxe fight in the real world, after all. Thus, our goal is not—and cannot be—to create skilled fighters, because that's simply impossible. Instead, our purpose is to learn what medieval combat was really like and gain some insight into how it was performed. In a way, we are like modern craftsmen who learn to recreate medieval crafts such as calligraphy, armor making, or cooking: we want to recreate a medieval art as accurately as possible in order to understand it. A Fechtmeister or "fight master" is the head of a school of combat. 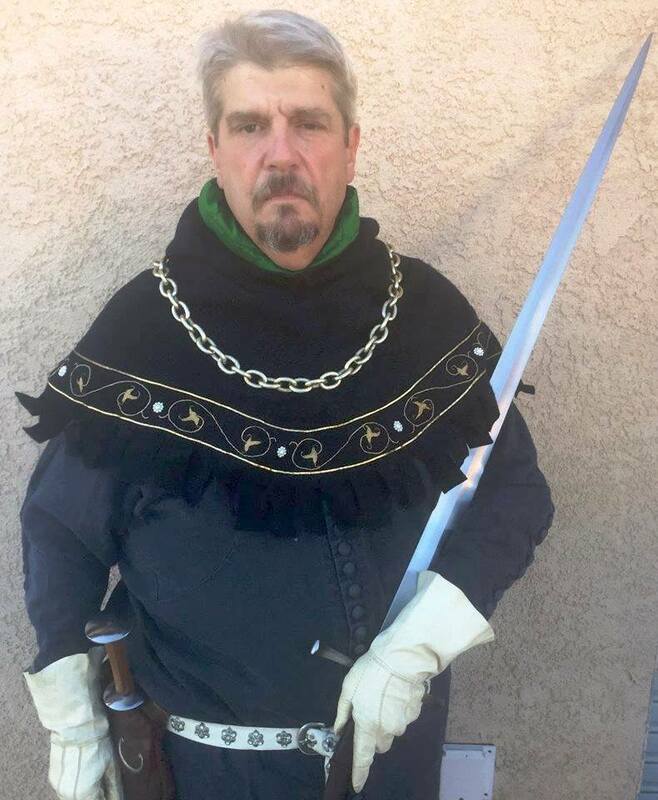 Our Fechtmeister, Hugh Knight (e-mail), has been studying medieval history and culture for more than thirty years, especially the combat arts. He collects medieval artifacts and reproductions, especially armor and weapons, and practices many of the skills appertaining to medieval knighthood, including falconry, hunting, and of course, medieval combat. Mr. Knight started his martial journey as a boy with traditional Japanese swordsmanship and jujutsu, and his study of medieval combat began more than twenty years ago. He found die Schlachtschule in 2003, and has published numerous books and articles on medieval combat since that time. He now resides in San Bernardino, California, where he continues to study, write, and teach Johannes Liechtenauer's art. The term "medieval" is a slippery one, and even professionals disagree somewhat as to its precise temporal definition. The earliest fencing manual extant is called "I. 33" and dates from the end of the 13th century: this gives us a starting date for our study. By the late 15th century the use of peasant foot soldiers armed largely with pole-weapons (and not gunpowder as so many, even professional historians, believe – the fully-armored knight was replaced long before individual firearms saw much use on the battlefield) had forced the armored knight from his place of pre-eminence on the battlefield. Since the purpose of die Schlachtschule is to study and teach the arts of combat appropriate to the knight, that serves to give us our ending date. So we will focus on the fencing manuals dating from the 13th through the late 15th centuries. There were two main schools of combat in our period: the German and the Italian. While there are some similarities between the two schools, there are major differences of philosophy. Many modern students of medieval martial arts tend to combine the teachings of both schools in their studies, but this, we believe, lessens the effectiveness of each, especially since some of their ideas are antithetical. That being the case, we have chosen to limit our curriculum to only one, and for a variety of technical reasons we have chosen the German school (although one of our major sources is Burgundian, it shows a direct connection to one of the German master’s teachings, as you will see below). Thus, the focus for die Schlachtschule is German fechtbücher from the 13th through the 15th centuries. Modern fencing scholars have taught that the arts of combat as practiced before the Renaissance were crude and unskilled when compared to the supposedly more "refined" arts of the rapier, but nothing could be farther from the truth. In fact, medieval martial arts were refined, elegant and comprehensive. They resembled the ancient Japanese martial ryu or "schools" of combat in which the bushi or samurai would train in a variety of arts, such as the sword, wrestling, the spear, the knife, etc., to become accomplished, all-around warriors. Medieval masters were just as concerned about having their students learn all of the arts appropriate to the day, teaching all forms of combat from wrestling to dagger to sword and buckler to longsword to pollaxe, and teaching the ways of fighting both in and out of armor. Moreover, they taught complete systems of combat, not just disparate tricks. Their works included instruction in the strategy and tactics of combat as well as the techniques themselves. Die Schlachtschule attempts to match those ancient schools by teaching a complete system of medieval foot combat, both armored and unarmored. Medieval combat could be broken into three categories: Blossfechten, Harnischfechten and Rossfechten, or unarmored, armored and mounted combat respectively. Due to the expense and rarity of horses in our modern world we have elected to limit ourselves to foot combat at this time. copyright 2019 Hugh T. Knight, Jr. All rights reserved.